Featured photo: Nguyen Trung Truc, the fifth member of the Brotherhood for Democracy that authorities have arrested in the past week. Greetings from Huong, Ella, and Kaylee from The 88 Project! We are bringing you news, analysis, and actions regarding human rights and civil society in Vietnam during the week of July 31 to August 6. As we entered into August this week, news came that since January, 19 activists have been jailed and deported by authorities in Vietnam. By the end of the work week, that total had increased to 21 with the arrest of a fifth member of the Brotherhood for Democracy, Nguyen Trung Truc, and college lecturer, Tran Tuan Kiet, arrested under Article 258. Mother Mushroom is reportedly suffering from health issues in prison, and Tran Thi Nga begins the second week of her brutal nine year sentence. News this week touches on art and activism, the potential impact of the U.S. administration on human rights in Vietnam, and the dispute between Germany and Vietnam over whether a wanted, former oil executive ended up back in Vietnam voluntarily or through force. This week, we remember the life of Dinh Dang Dinh, who died from stomach cancer just after his release from prison in April 2014. August 8 marks five years since he was sentenced to six years in prison. Finally, please take actions for the activists detained in the massive string of arrests on July 30– Nguyen Trung Ton, Nguyen Bac Truyen, Pham Van Troi, and Truong Minh Duc, and for Tran Thi Nga. According to Vietnamese pro-human rights organization Con Duong Viet Nam, 19 activists (and 21 after the arrests of Nguyen Trung Truc and Tran Tuan Kiet) have been persecuted by authorities in Vietnam so far this year. Seven were arrested under Article 88. Nine activists were targeted in June and July alone. See the photo below for more details (in Vietnamese). Nguyen Ngoc Nhu Quynh, aka Me Nam – Mother Mushroom, is suffering from ailments in prison. She has begun her second month in prison after being sentenced to ten years on June 29, 2017. Her mother, Mrs. Nguyen Thi Tuyet Lan, was able to see her for the first time since her trial on July 31. Mrs. Lan shared on her Facebook page that Quynh is in poor health. Two weeks prior to the visit, Quynh was sick, and since then, her fingers are all curled up and cramp often. The prison authorities did not provide her with enough medication for her illness, nor do they allow the family to send her medical supplies. Tran Tuan Kiet, who works at a college, has been arrested under Article 258 for “abusing democratic freedoms.” He had previously been singled out by school administration for commenting on school affairs, such as on an unjust promotion. He faces up to three years in prison. Nguyen Trung Truc is the fifth member of the Brotherhood for Democracy that authorities have arrested in the past week, following the arrests of four other members on July 30. Some believe that these men have been targeted for their alleged connections to lawyer Nguyen Van Dai, co-founder of the Brotherhood for Democracy, who is currently in pre-trial detention. Mr. Truc was arrested at his home on August 4 and charged under Article 79. He is a former prisoner of conscience. While Vietnam’s music scene may be ripe with catchy, less conservative tunes and well-known young stars, challenging the Communist regime through music remains largely taboo. Singer Mai Khoi’s career has evolved from that of pop sensation to underground folk artist. This article profiles her, fellow artist Ngoc Dai, and the studio they record in. Radio Free Asia interviewed Mai Khoi about her experiences of being interfered with by police at her private show on Saturday July 22 at Studio Number 21 in Hanoi, in which she intended to perform songs that touch on social issues to a small audience. Watch the interview, in Vietnamese. Trump factor weights as Vietnam intensifies crackdown on dissidents: “Every activist and analyst that Reuters interviewed mentioned a perceived shift in U.S. priorities under Trump as a new factor in reducing pressure on Vietnam’s government. On July 25, Tran Thi Nga was sentenced to nine years in prison and five years of probation under Article 88 for her online content associated with her advocacy work. She has long been a champion of migrant labor and land rights. Since imprisoned, prison authorities have refused to deliver food and money from her family to Ms. Nga. Four former prisoners of conscience were re-arrested July 30: Nguyen Trung Ton, Truong Minh Duc, Nguyen Bac Truyen, and Pham Van Troi. They are all associated with the Brotherhood of Democracy, an organization founded in part by currently detained lawyer Nguyen Van Dai, and have been charged under Article 79 of Vietnam’s Penal Code for activities deemed to be subversive. 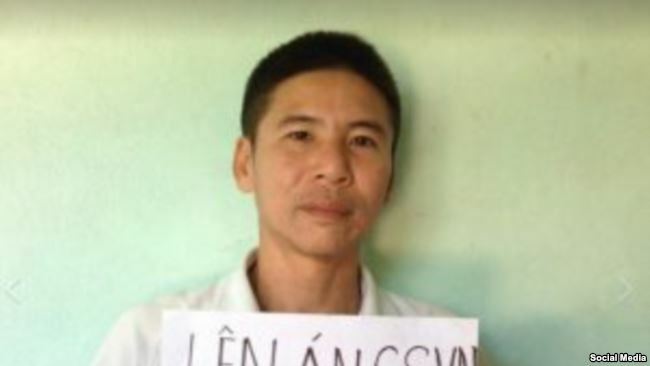 Veteran Le Dinh Luong, 52, was arrested on July 24, also on charges of subversion. He writes on environmental issues and has been targeted by authorities for connections to Viet Tan, an overseas democracy group labeled as terrorists by the Vietnamese government. August 8 marks five years since Dinh Dang Dinh was sentenced to six years in prison under Article 88. Mr. Dinh, a former teacher and soldier, as well as a blogger, was arrested in 2011 and after sentencing in 2012, was diagnosed with cancer while in prison. He was briefly allowed to receive medical treatment outside of prison and finally was released from prison in March 2014. He died on April 3, 2014, at age 50. This week, we remember his life and the impact that imprisonment has on the mental and physical health of prisoners of conscience. Please take Amnesty International’s Urgent Action for the four dissidents involved in various civil society organizations that were arrested under Article 79 on July 30 amidst a brutal summer for activists in Vietnam. They are Nguyen Trung Ton, Nguyen Bac Truyen, Pham Van Troi, and Truong Minh Duc. You can also Take Action for Tran Thi Nga with Amnesty International Canada. Find out what you can do, here.